For the British single-seat biplane fighter of the 1930s, see Fairey Firefly II. The Fairey Firefly was a British Second World War-era carrier-borne fighter aircraft and anti-submarine aircraft of the Fleet Air Arm (FAA). Designed to the contemporary FAA concept of a two-seat fleet reconnaissance/fighter, the pilot and navigator/weapons officer were housed in separate stations. It was superior in performance and firepower to its predecessor, the Fulmar, but entered operational service only towards the end of the war when it was no longer competitive as a fighter. The limitations of a single engine in a heavy airframe reduced its performance, but it proved to be sturdy, long-ranged, and docile in carrier operations. 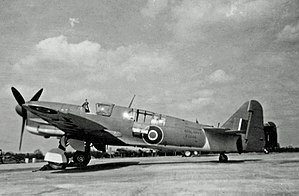 The Fairey Firefly served in the Second World War as a fleet fighter but in postwar service, although it was superseded by more modern jet aircraft, the Firefly was adapted for other roles, including strike operations and anti-submarine warfare, remaining a mainstay of the FAA until the mid-1950s. UK and Australian Fireflies flew ground attack operations off various aircraft carriers in the Korean War. In foreign service, the type was in operation with the naval air arms of Australia, Canada, India and the Netherlands whose Fireflies carried out a few attack sorties as late as 1962 in Dutch New Guinea. Before the war, in 1938 the Air Ministry issued two specifications for two naval fighters, a conventional and a "turret fighter". Performance for both was to be 275 knots at 15,000 ft while carrying an armament, for the conventional fighter, of eight 0.303 Browning machine guns or four 20mm Hispano cannon. This would replace the Fulmar which had been an interim design. These specifications were updated the following year and several British manufacturers tendered their ideas. Further changes to the official specification followed, the turret fighter specification was dropped and a modified specification issued to cover single and dual seat fighters capable of 330 and 300 knots respectively. Fairey offered designs that could be single or two seater and powered by the Rolls-Royce Griffon, or a larger airframe with a Napier Sabre. After consideration of manufacturers responses, Specification N.5/40 replaced the earlier specifications. Due to the necessity of navigating over open sea, it was for a two-seater alone. For defence of naval bases a separate single seater design would lead to the Blackburn Firebrand. The Firefly was designed by H.E. Chaplin at Fairey Aviation; in June 1940, the Admiralty ordered 200 aircraft "off the drawing board" with the first three to be the prototypes. The prototype of the Firefly flew on 22 December 1941. Although it was 4,000 lb (1,810 kg) heavier than the Fulmar (largely due to the heavier Griffon engine and the armament of two 20 mm Hispano cannon in each wing), the Firefly was 40 mph (60 km/h) faster due to improved aerodynamics and a more powerful engine, the 1,735 hp (1,294 kW) Rolls-Royce Griffon IIB. The Firefly was a low-wing cantilever monoplane with oval-section metal semi-monocoque fuselage and conventional tail unit with forward-placed tailplane. It was powered by a Rolls-Royce Griffon liquid-cooled piston engine with a three-blade airscrew. The Firefly had retractable main landing gear and tail wheel, with the hydraulically operated main landing gear retracting inwards into the underside of the wing centre-section. The aircraft also had a retractable arrester hook under the rear fuselage. The pilot's cockpit was over the leading edge of the wing and the observer/radio-operator/navigator aft of the wing trailing edge - positions which gave better visibility for operating and landing. Both crew had separate jettisonable canopies. The all-metal wing could be folded manually, with the wings ending up along the sides of the fuselage. When in the flying position, the wings were hydraulically locked. Handling and performance trials were first undertaken at Boscombe Down in 1942; by 1944 the Firefly was cleared to use underwing rocket projectiles and by April 1944 tests with a double underwing load of 16 rockets and two 45 gallon (205 l) drop tanks still provided acceptable handling. Further testing with two 90 gallon (410 l) drop tanks or two 1,000 lb (454 kg) bombs deemed acceptable albeit with "...a small adverse effect on handling..." while "...handling with a single 1,000 lb (454 kg) bomb was unpleasant, but manageable." Performance trials at 11,830 lb (5,366 kg) indicated a maximum speed of 315 mph (508 km/h) at 16,800 ft (5,121 m); a climb to 20,000 ft (6,096 m) took 12.4 minutes, with a maximum climb rate of 2,140 fpm (10.87 m/s) at 3,800 ft (1,158 m), and a service ceiling of 30,100 ft (9,174 m). The primary variant of the aircraft used during the Second World War was the Mk I, which was used in all theatres of operation. In March 1943, the first Firefly Mk Is were delivered but they did not enter operational service until July 1944 when they equipped 1770 Naval Air Squadron aboard HMS Indefatigable. The first operations were in Europe where Fireflies carried out armed reconnaissance flights and anti-shipping strikes along the Norwegian coast. Fireflies also provided air cover during strikes on the German battleship Tirpitz in 1944. Throughout its operational career, the Firefly took on increasingly demanding roles from fighter to anti-submarine warfare stationed mainly with the British Pacific Fleet in the Far East and Pacific theatres. Fireflies carried out attacks on oil refineries and airfields and gained renown when they became the first British-designed and -built aircraft to overfly Tokyo. After the Second World War, the Firefly remained in front line service with the Fleet Air Arm until the mid-1950s. The UK also supplied the aircraft to Canada, Australia, Denmark, Ethiopia, the Netherlands Naval Aviation Service, India and Thailand. The Royal Canadian Navy employed 65 Fireflies of the Mk AS 5 type onboard its own aircraft carriers between 1946 and 1954. It also had some Mk I Fireflies, and sold several additional examples of these to Ethiopia in the early 1950s. British and Australian Fireflies carried out anti-shipping patrols and ground strikes off various aircraft carriers in the Korean War as well as serving in the ground-attack role in the Malayan Emergency. The Firefly's FAA front line career ended with the introduction of the Gannet. Several versions of the type were developed later in its career to serve as trainers, target tugs and drone aircraft. As an example, the Indian Navy acquired 10 aircraft in the mid-50s for target tug purposes. In 1960, in response to Indonesian territorial demands and threats, the Netherlands deployed Firefly AS.Mk 4s to Dutch New Guinea. As Indonesian forces began to infiltrate the territory, the Fireflies carried out a few attack operations in early 1962, before a political settlement was negotiated. Indian Naval Air Arm operated Fireflies from 1955 onwards for target tugging. Svensk Flygtjänst AB at Bromma Airport operated 19 TT.1 aircraft between 31 January 1949 and 17 October 1963. Royal Thai Air Force operated Fireflies between 1952 and 1966. Royal Navy - Fleet Air Arm operated Fireflies in the anti-submarine role until 1956 when front line aircraft were replaced by the Fairey Gannet. WB518 was one of the first 10 Mk 6s built, but retained the earlier Mk 5 fuselage. It was originally delivered to the Royal Australian Navy's 817 Squadron and then served in 816 Squadron before being retired and ending up as a memorial on a pole in Griffith, New South Wales, Australia. WB518 was then purchased by American Eddie Kurdziel, a Northwest Airlines captain and former U.S. Navy pilot. WD518 was extensively restored and made its first public appearance at Oshkosh in 2002. Restoration of WD518 used parts salvaged from WD828 which was written off after a crash into a cabbage field in Camden, New South Wales in 1987.WB518 as of July 2015 was then undergoing extensive rebuilding and is now in flying condition out of Gillespie Field, El Cajon, California. AS 6 WD833, another ex-Australian Flying, is owned by Henry "Butch" Schroeder who moved the aircraft to Danville, Illinois, USA for restoration. The present whereabouts of this aircraft are unclear. The Royal Thai Air Force Museum in Bangkok, Thailand has a Firefly Mk I on display. A sole remaining Firefly of the 10 acquired by India is displayed at the Naval Aviation Museum in Goa. Two ex-Swedish Fireflies moved to IWM Duxford, Cambridgeshire in 2003. Acquired by the Aircraft Restoration Company, they were in Royal Navy service from 1944 and 1946, converted to target tugs for gunnery training in 1950 and 1954. One is to be restored to flying condition, and the other for static display. As well as the Canadian Warplane Heritage's ex-Australian Firefly, two other Fireflies are known to exist in Canada: one is at the Canada Aviation and Space Museum in Ottawa and another is being restored at the Shearwater Aviation Museum at Eastern Passage (near Dartmouth), Nova Scotia. Both are Mk I models that served in the Canadian Navy from 1946 to 1954, after which they were sold to the Ethiopian Air Force. Following their discovery in the Ethiopian desert in 1993, they were repatriated to Canada. ^ Buttler, Tony. Blackburn Firebrand - Warpaint Number 56. Denbigh East, Bletchley, UK: Warpaint Books Ltd., 2000. ^ Thetford 1978, p. 164. ^ Bridgman 1988, pp. 118–119. ^ a b Mason 1998, p. 277. ^ Mason 1998, p. 306. ^ Thetford 1978, p. 168. ^ "Fairey Firefly TT.1 & TT.4." bharatrakshak.com. Retrieved: 9 August 2010. ^ Bishop and Moeng 1997, p. 73. ^ "Cochin - Birth Place of Naval Aviation." warbirds.in. Retrieved: 9 August 2010. ^ "Firefly TT.1 DT989." Warbirdregistry.org, Retrieved: 9 August 2010. ^ "Firefly FB.1 MB410." Warbirdregistry.org. Retrieved: 9 August 2010. ^ "Building 1: Aircraft flown by RTAF after WW2." Archived 26 October 2013 at the Wayback Machine Royal Thai Air Force Museum. Retrieved: 10 April 2012. Bussy, Geoffrey. Fairey Firefly: F.Mk.1 to U.Mk.9 (Warpaint Series 28). Milton Keynes, UK: Hall Park Books Ltd., 2001. OCLC 65202534. Wilson, Stewart. Sea Fury, Firefly and Sea Venom in Australian Service. Weston Creek, ACT, Australia: Aerospace Publications, 1993. ISBN 1-875671-05-6. Wikimedia Commons has media related to Fairey Firefly. This page was last edited on 12 February 2019, at 11:41 (UTC).